Thanks to 2/Lt Robert H. "Bob" Crowther (Radarman) and S/Sgt James L. "Les" Morgan (Left Gunner). Prior to June 5, Cpt Herbert A. Frank transferred to Crew #3913. 1/Lt William G. Catts, from Crew #3910, took his place. S/Sgt John C. Ward (CFC) [WIA] joined the crew prior to June 5. Photo courtesy of S/Sgt James L. "Jim" Morgan, Jr (Gunner), all rights reserved. Kneeling - Left to Right: T/Sgt Ralph B. Kennerly, Jr. (CFC), S/Sgt Woody J. 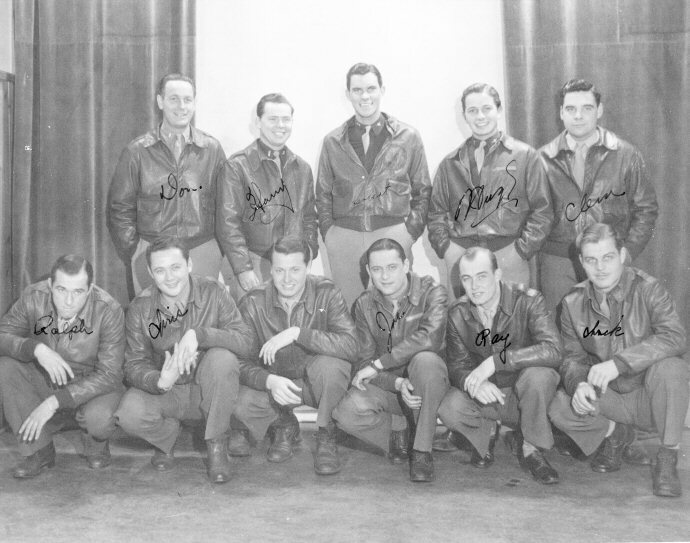 "Chris" Christopher (Tail Gunner), S/Sgt James L. "Les" Morgan (Left Gunner) [WIA], Sgt Joseph F. "Joe" Cameron (Radio), S/Sgt Raymond L. "Ray" Merritt (Radarman) [KIA], S/Sgt Charles P. "Chuck" Magnuson (Right Gunner) [KIA]. "Forever Amber" was shot up badly during the fire bombing mission to Osaka on the night of June 5, 1945. During the bomb run, the B-29 was caught in a web of radar guided searchlights, and flak tore through the bomb bay. The direct hit killed the radar operator (Sgt Raymond L. Merritt) wounded two of the gunners (S/Sgt John C. Ward and S/Sgt James L. Morgan) and [seriously injured] another (S/Sgt Charles P. Magnuson) - although the radio operator tried to save him with a direct blood transfusion from Aircraft Commander Lt Catt's arm, he died later. The aircraft struggled back to Iwo, but would never fly again. The aircraft landed at Saipan so that the men could receive immediate medical attention. S/Sgt James L. Morgan recovered from his injuries and returned to duty. S/Sgt John C. Ward returned home. Following that mission, the crew was assigned to "Myas' Dragon". Lt Robert H. "Bob" Crowther (Radarman) replaced Sgt Raymond L. Merritt and Sgt John R. "Ray" Pritchard, Jr. (CFC), replaced S/Sgt John C. Ward. Sgt Howard J. Goodyear (Radio) replaced Sgt Joseph F. Cameron. Pfc Francis A. "Frank" Mirigliono (Right Gunner) replaced S/Sgt Charles P. Magnuson. The flight log of 2/Lt Robert H. "Bob" Crowther (Radarman) indicates the missions they flew after June 5. 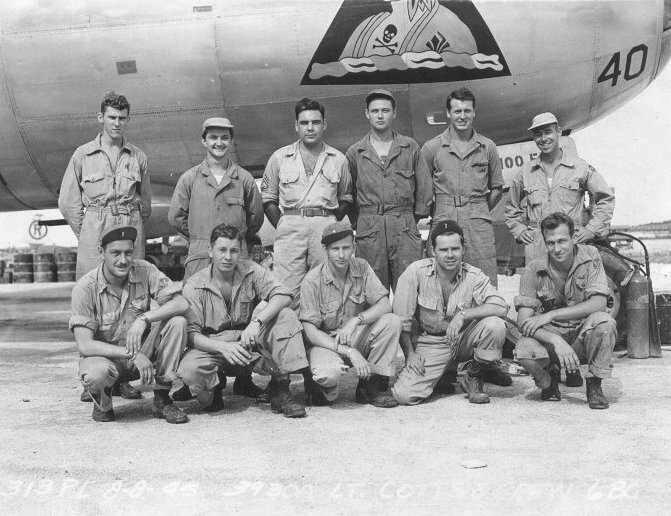 Crew #3914 in front of " Myas' Dragon"
Kneeling - Left to Right: 1st Lt Donald W. Grimme (Bombardier), 1st Lt Hugh E. Roberts (Pilot), Capt William G. Catts (Aircraft Commander), 1st Lt Harry Jarvis (Navigator), 2d Lt Robert H. "Bob" Crowther* (Radarman). This crew originally flew "Forever Amber", until that airplane was badly damaged on the June 5 mission to Kobe. The crew was later assigned to "Myas' Dragon".